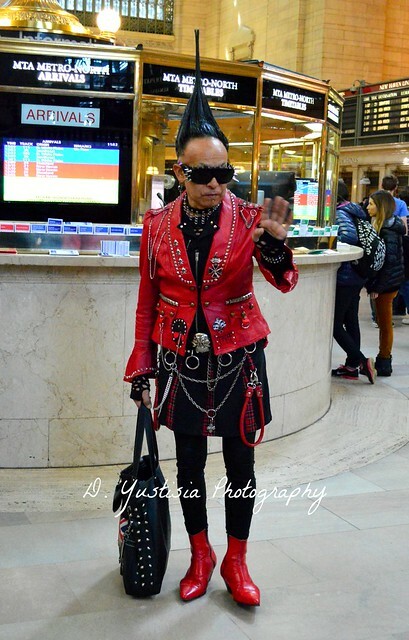 While I was walking towards Grand Central Terminal, accompanying my two daughters and their friend, I came upon this man. I was taking several shots of the Chrysler Building at night, when suddenly my eyes saw the man sleeping on the sidewalk. He laid down on what it seemed to be two pieces of cardboard. The man crossed his legs and covered his body with a jacket. His face was partially hidden under a baseball cap. The man’s trolley, his primary tool of transporting and holding things, laid close to him. Under his head was what I believed to be his possessions, in a bag, that became his pillow. As the dusk set, the wind blew a little bit chillier. People kept on passing by, some would stop to take pictures of the Chrysler Building. 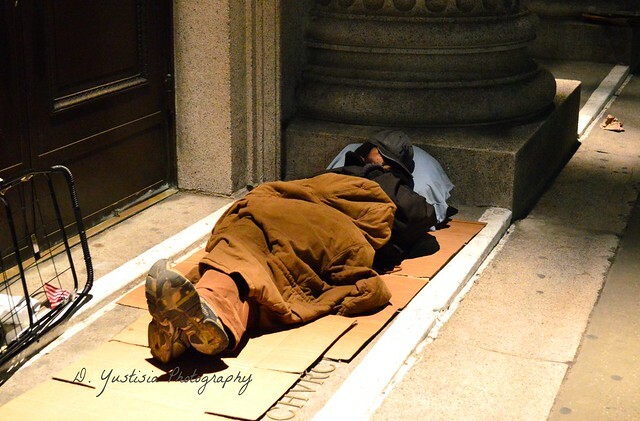 Under the dim lights in a somewhat quiet street between some buildings with upscale shops, bar and cafes, a man slept soundly without any care in the world. Scattered litters around him, dusts that settled and blown away by the wind, didn’t bother him at all. I took one shot of the man, and kept on walking. I didn’t want to wake him or maybe I tried getting away before I felt guilty for him. In my head, I could hear a song,”She calls out to the man on the street. Sir, can you help me? It’s cold and I’ve no where to sleep. Is there somewhere you can tell me?” The night sky had darkened and on a train ride home, the song kept playing in my head. “It’s just another for you and me in paradise. Oh, think twice, it’s just another day for you, you and me in paradise”. I took my girls to New York last weekend for their spring break. When we just arrived at Grand Central Terminal and bought some baked goods, we saw a man passing us by. The man wore a red jacket, a skirt and red boots. 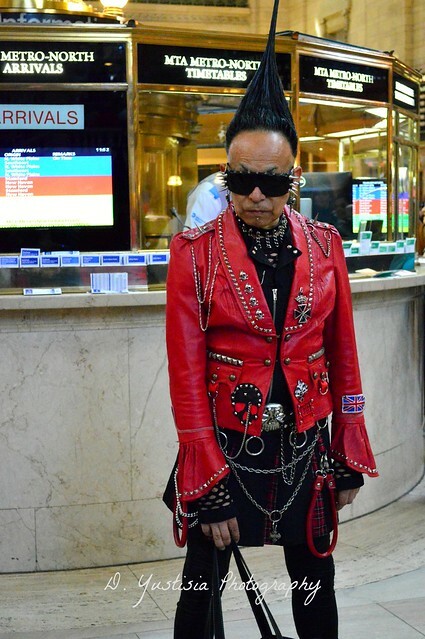 He also had a very unique hair style, had lots of accessories on him and on his wardrobe. He was about between 60-70 years old. Having coming from a traditional and rather conservative upbringing, I know there’s a rule about people from certain age should act their age. But I don’t believe this man really cared about that rule. 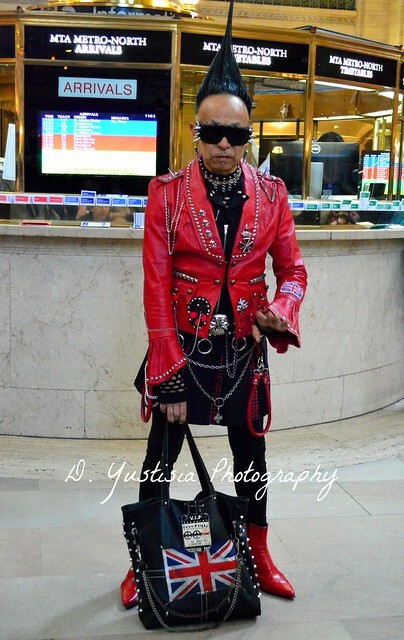 He walked with confidence, with his black canvas bag that had Union Jack, chains and metal spikes on it. It turned out that at the same moment, there were some people from photography club or some kind, who were having their photo hunting at Grand Central. Right away, the man with the red jacket became their point of interest and just like a professional celebrity, the man posing for the cameras ready for his red carpet moment. I couldn’t hear any of the small talk some people had with the man. I wished I knew. I wondered my self why he was wearing such an eccentric attribute. For what purpose? I think everyone’s curiosity was similar at that point. Meanwhile, we were really amused by the man. He reminded me that once in a lifetime, you’re allowed to go all out. Even though some may think you’re nuts or silly, there’s nothing beats the feeling of being one of a kind.